Every masterpiece begins with an idea. Whether the client has a strong vision of what they want or a design created with a stone they have collected, our designer Fei will collaborate thoughts with the client to create their dream jewellery. To design the client’s ultimate masterpiece, Fei will learn about their personality. As well as, the client’s style and interest. With all the information in hand, Fei is able to design a piece the client’s perfect bespoke piece. For something more tailored to your taste, sent an email via the provided contact form. Before we start production, we ask for a 50% deposit. Please also bear in mind, the production can take between 6-8 weeks. 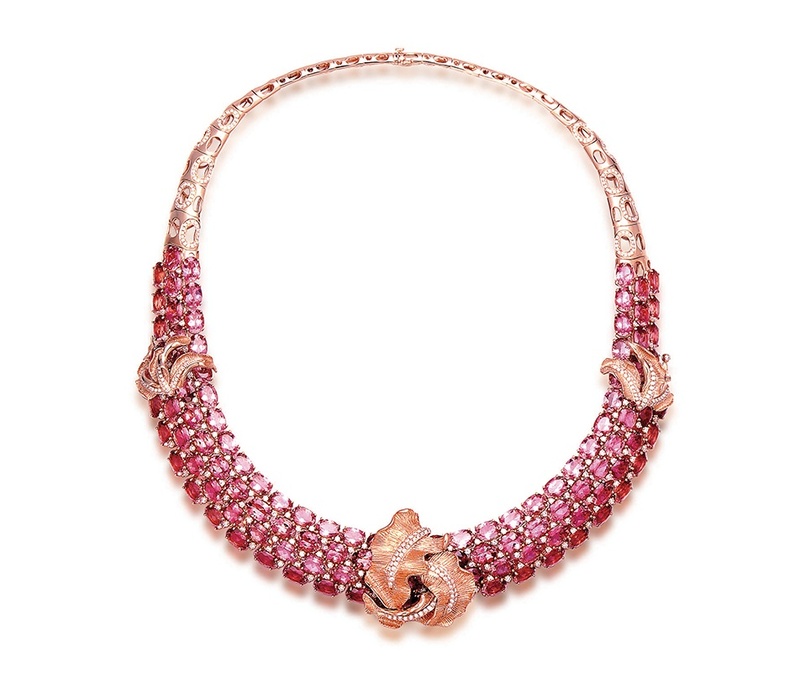 A neckpiece set with 509ct tourmaline beads. Each varying in size. 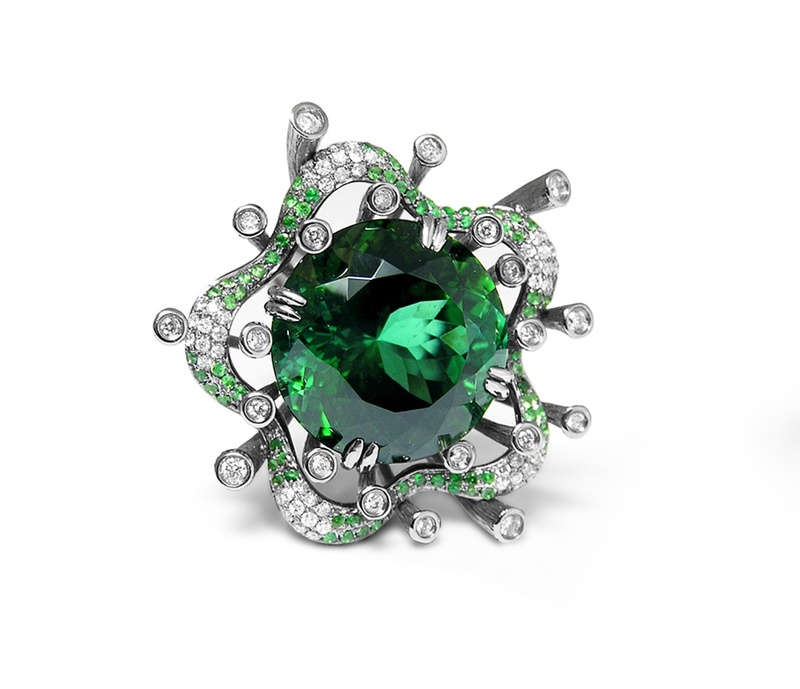 Moreover, 17.7ct white diamonds and 19.6ct green garnets add texture and contrast against the smooth beads. 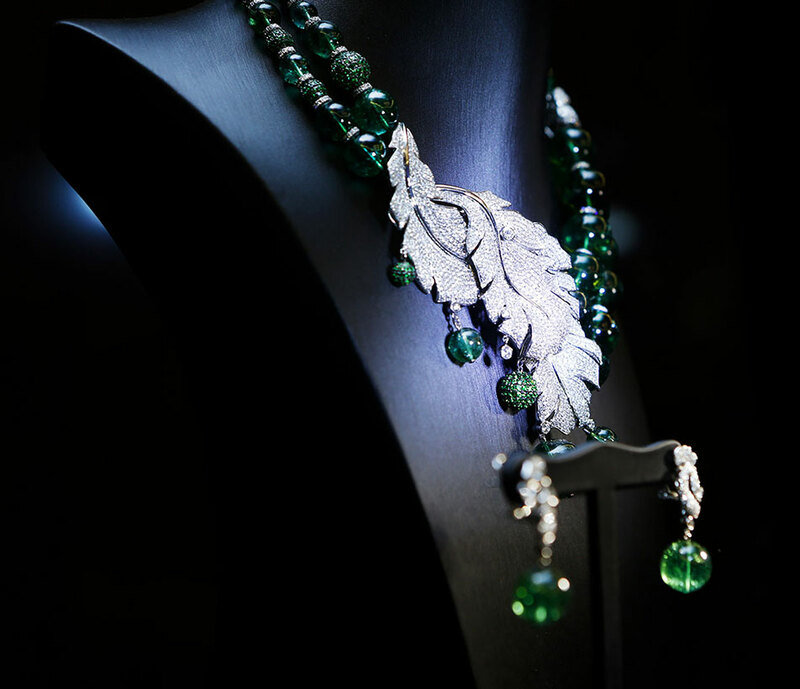 Moreover, the feather centrepiece is a brooch, which is detachable from the beaded neckpiece. Winner of the IJL Editor’s Choice Award 2015. A platinum ring featuring a 10ct unheated sapphire. Designed to wear on the red carpet as well as on the motorbike. This neckpiece combines volcanic rock and black diamonds set in 18ct black gold. In contrast, the 18ct white gold mane articulate and radiates with diamonds. Hand-carved Russian nephrite makes the Unicorn’s face. This ‘Ruby Helix Ring’ has gone through eight months of design and manufacturing. 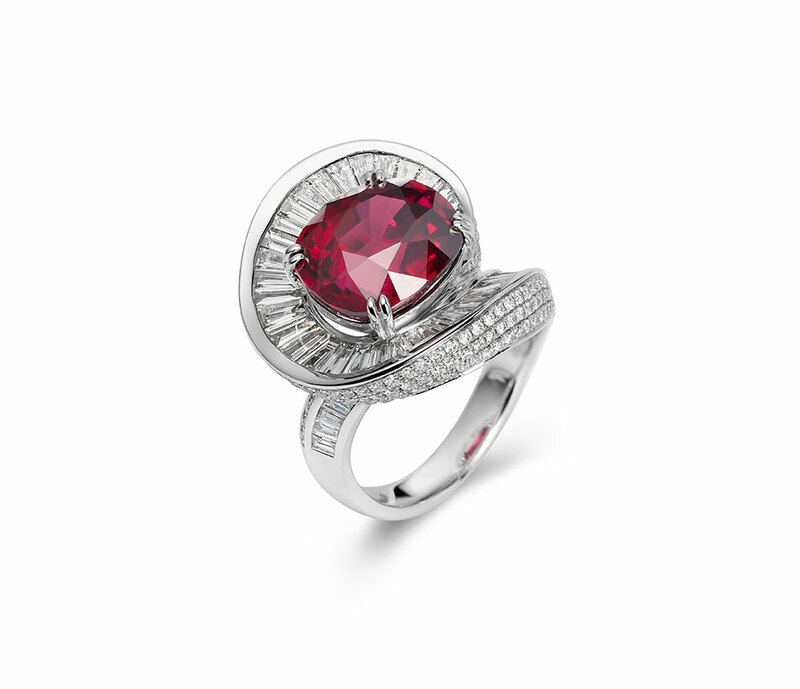 The alluring centre stone is a 10ct unheated Mozambique ruby. 5ct hand-cut white diamonds decorate the twisting frame of 18ct white gold. Featured in jewellery specialist’s, Joanna Hardy‘s, ‘Ruby’ book. 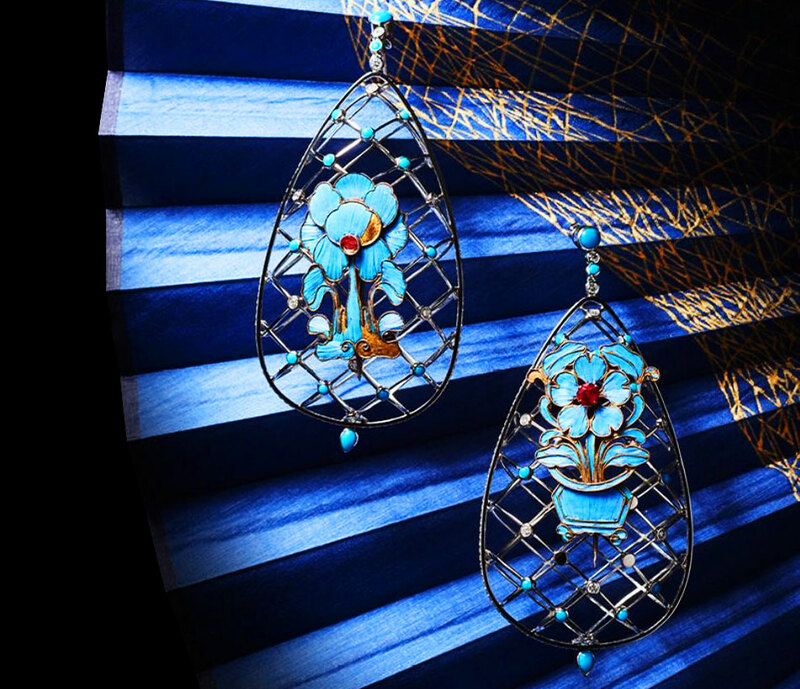 Hollow platinum cage earrings set with turquoise and diamonds. The Kingfisher feathers and are from the hairpiece of a concubine. During the Qin Dynasty dating 200BC. Winner of the Lonmin design innovation award 2011. 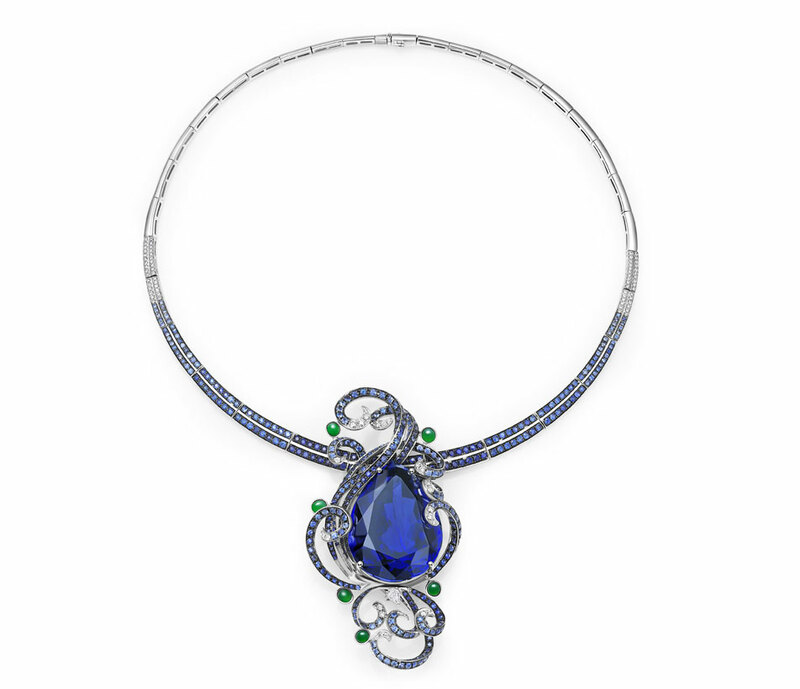 A dramatic neckpiece featuring a 103ct pear cut tanzanite stone. Surrounding the tanzanite are billowing swirls of 18ct white gold. Set with blue sapphires, white diamonds and cabochon jadeite. The pendant is removable, allowing the wearer to wear as a brooch. 18ct rose gold textures leaves with veins of white diamonds. The rows of pink tourmalines were hand-picked. Resulting in a uniform pink hue. Interspersed through the vivid tourmalines are white diamonds. This design is focused on jade. 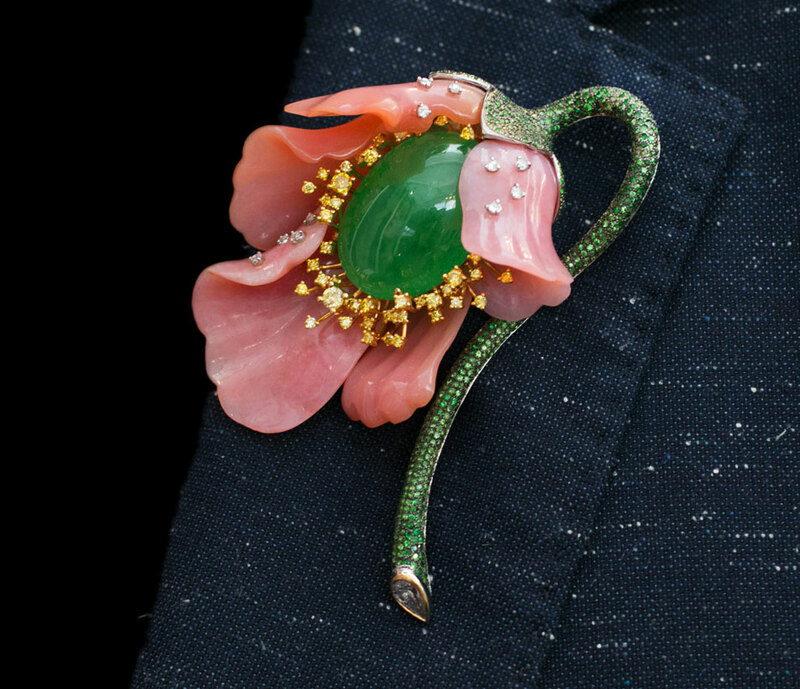 The Opal Poppy Brooch required complex craftsmanship to construct and assemble. The jade alone is work £80k. Each componant of the poppy-inspired brooch consists of varing materials. The centre of the flower comprises of the traditional jade. As well as stamens of yellow diamonds. In addition, hand-carved Australian opals embrace the inner parts of the poppy. To imitate raindrops, white diamond sit atop the delicate petals. Finally, the stem is set with green garnets before the assemblance of the brooch. Read more about the inginiuty of poppy brooch’s craftsmanship on our blog. 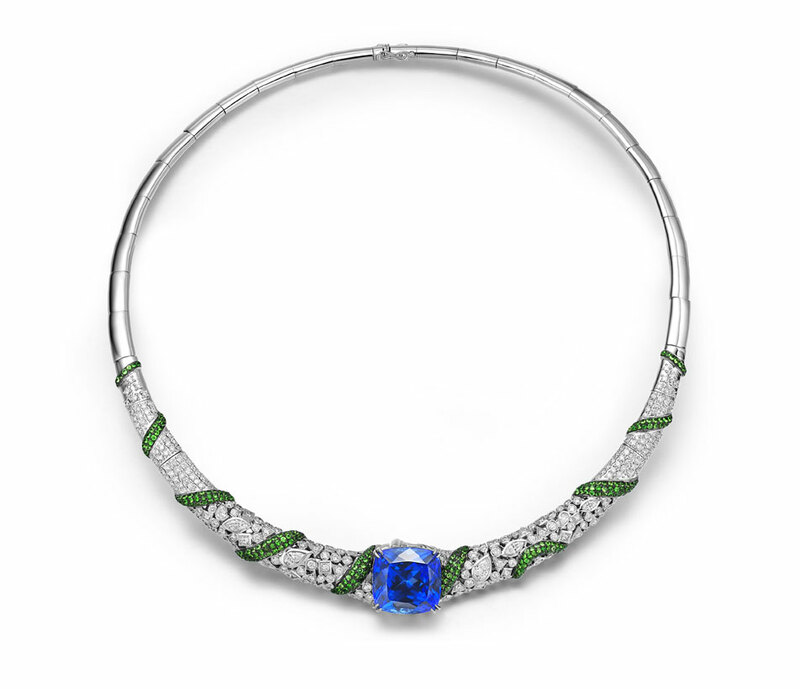 An 18ct white gold neckpiece, featuring a 24ct cushion tanzanite. 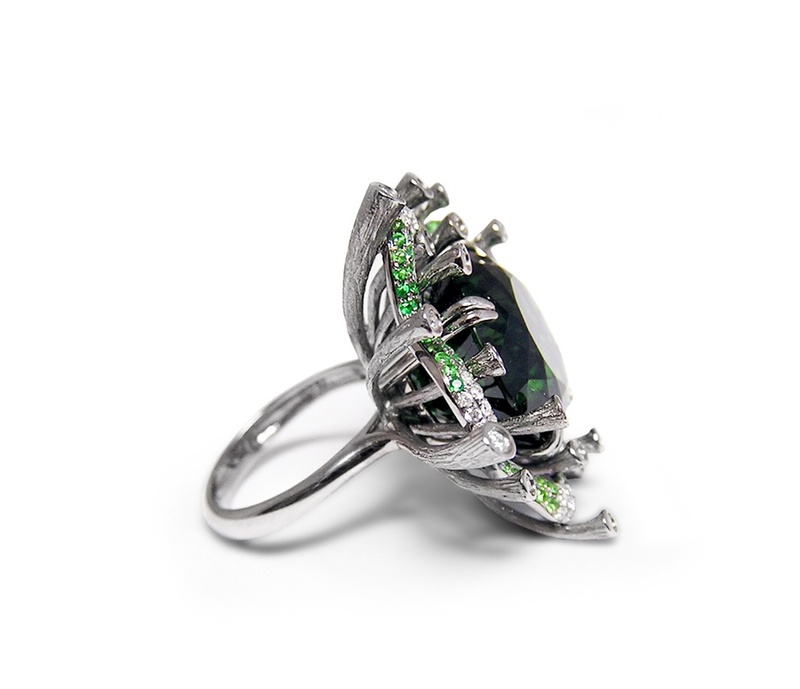 Furthermore, different cuts of white diamonds, twists of green garnets surround the central tanzanite. 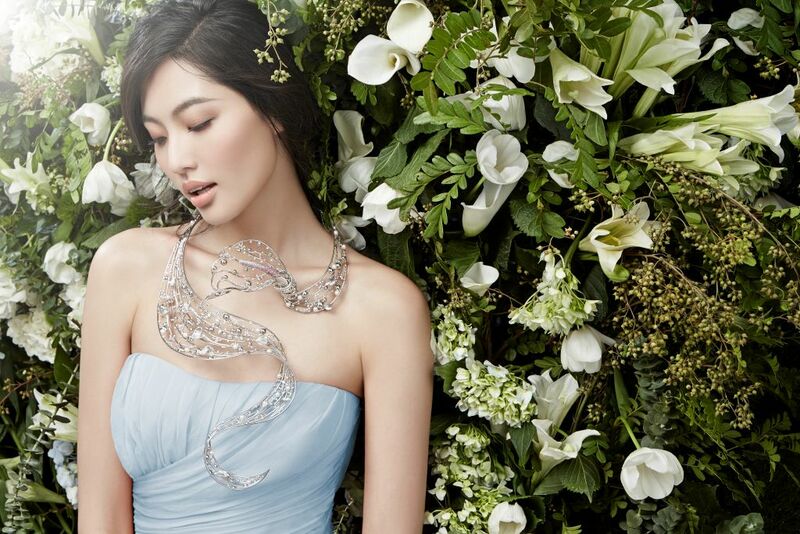 A collaboration piece for Chow Tai Fook’s 85th Anniversary. Inspired by the flowers and the flowing water. 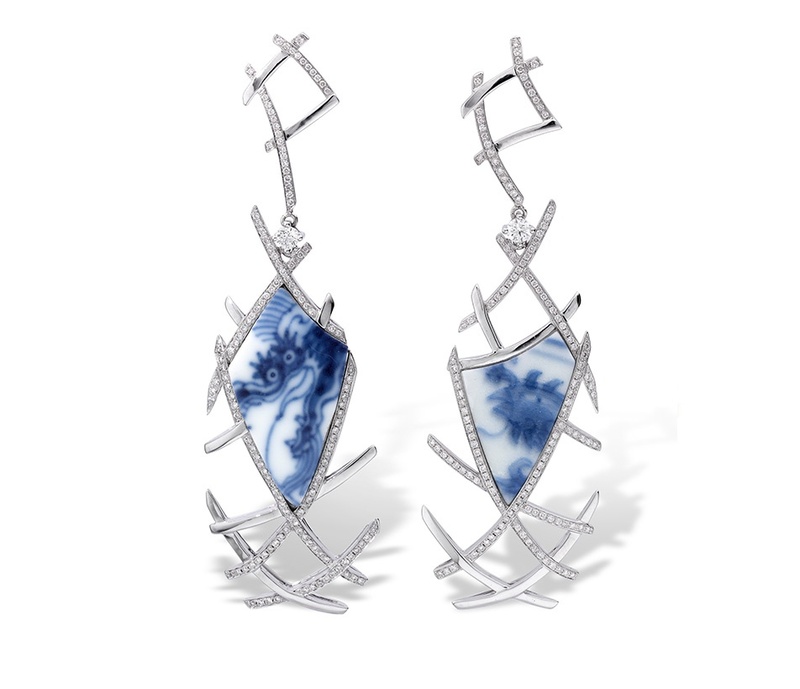 Portraying the cascading water is the sophisticated silhouettes of platinum. Likewise, dozens of blossoming calla lilies and lily of the valley flower through the sea of platinum. Furthermore, ‘The Fountain of True Beauty’ brings to life the limitless facets of a woman’s true beauty and personality. 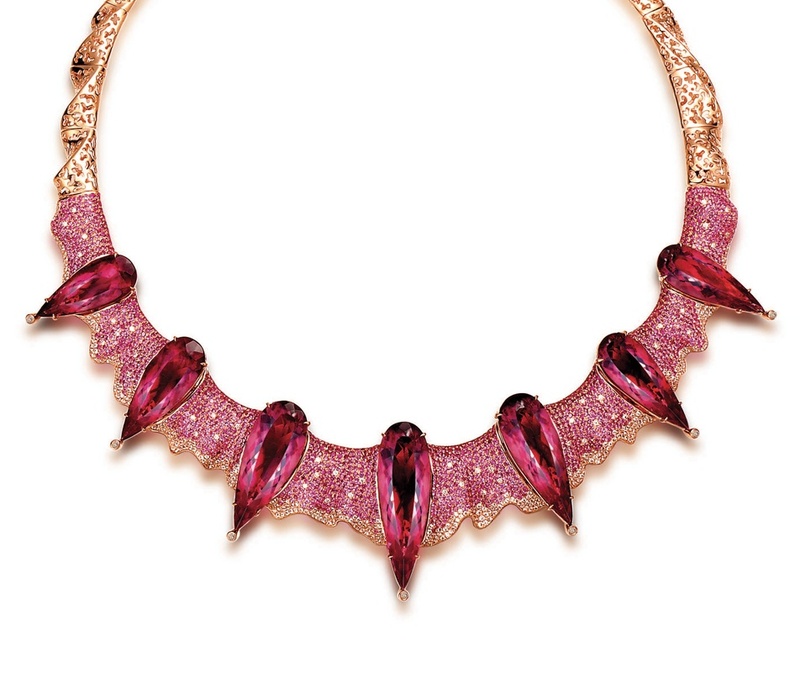 An 18ct rose gold neckpiece, featuring seven intense pear cut rubellite. Furthermore, it is set amongst waves of sparkling pave pink sapphire and white diamonds. Platinum earrings and pendant set featuring 40ct cushion cut fancy yellow diamonds. Likewise, this vintage-inspired set with modern appeal blossoms with diamond-set asymmetric floral motifs. A lattice platinum pair of earrings with linear pavé accents. Featuring traditional antique blue and white porcelain, acquired from the China Qing Dynasty. Winner of the International Platinum Jewellery Designer Lonmin Innovation Award. 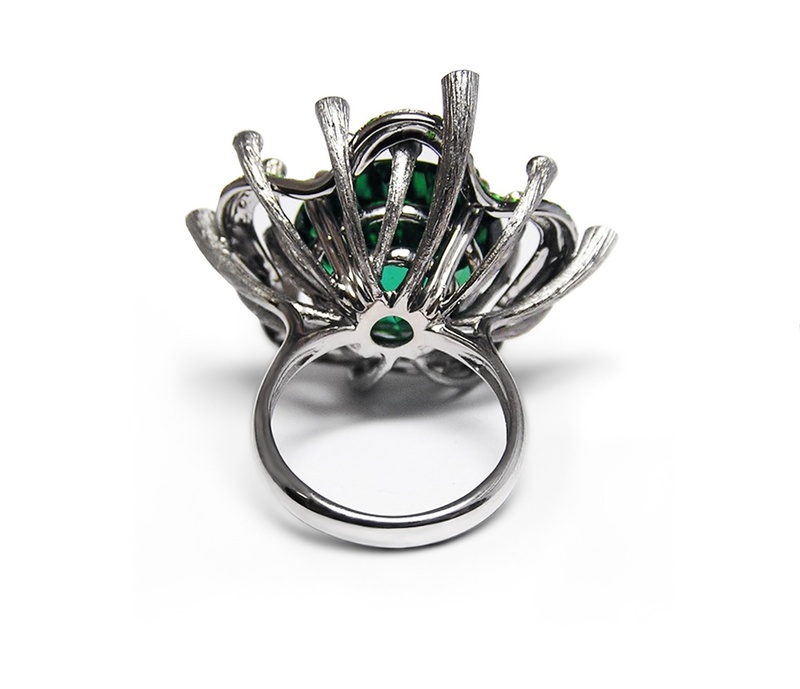 18ct white gold ring featuring a 20ct green tourmaline. Surrounded by a flowerer petal style panel and spokes. 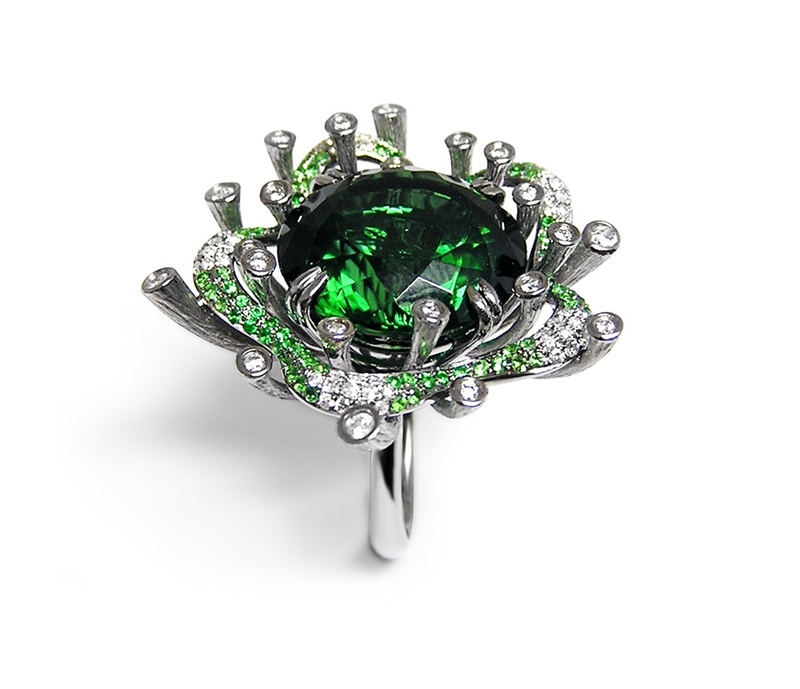 Set with 1.60ct diamonds and 0.30ct green garnets.